This level has medium difficulty. 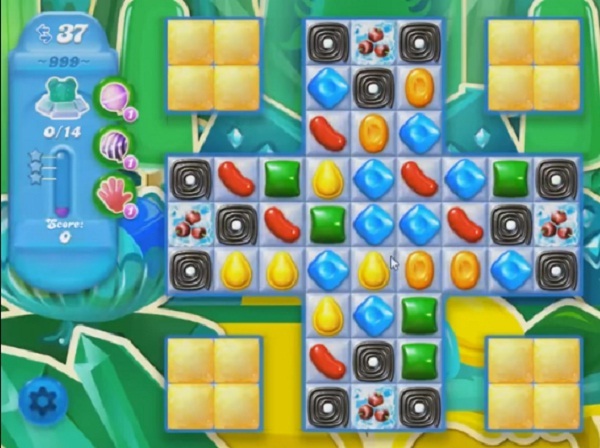 For this level try to play more from middle part of the board where more candies are available to play. Make special candy and striped candy. Combine them with each other to break the blockers that are in corner part of the board. There is absolutely no way to win this level. Unlike in the video, Android has fewer moves & the fish work against you. It’s impossible to get the corners. Bye bye soda. NEED HELP on this level can only save 8 bears cannot get the bears in the 4 corners need a lot of candy bombs with fish or special candies takes too many moves to clear BLOCKERS candies don’t show up like in your VIDEO I will APPRECIATE it SO much if you will HELP me get this one ABOUT READY to GIVE UP can’t even get close to saving all the bears THANK YOU SO MUCH.